We are entering a new era in digital audio, the era of the PowerDAC. What is a PowerDAC? It is a digital-to-analog converter that doubles as a power amplifier. It could be called an integrated DAC/amplifier, but PowerDAC sounds portentous. Let your mind trickle over the potential of a product… a DAC that also functions as a power amplifier. Do you understand the implications of the emergence of such a product? In an era where digital music is the medium of the masses, and where convenience scores higher on most people’s lists than sound quality, the PowerDAC will address both convenience and sound quality at a reasonable price. The Exogal Ion PowerDAC, the subject of this review, is small and light at only 9 pounds, aesthetically pleasing, is easily operated, controlled with personal devices such as phones and tablets, and breaks ground with a sound quality experienced by very few audiophiles in the solar system. Let’s begin by acknowledging the harsh reality associated with technology creep and the advent of new components. Technology creep is a phrase I have coined to portray the incessant march of technological development and how that development works its way into our lives. Over time our components, yea, the entire system that was at a very high level of performance years ago slips in terms of its performance relative to today’s standard. State-of-the-art sound is never a destination, but rather an incrementally moving target. Unless an audiophile has been experiencing newer equipment and upper end systems, it is easy to think that there has not been that much change in terms of good sound. Our memories also fool us into thinking that the sound we heard many years ago was as fine as the sound we hear today. Neither is true. Once we set aside our nostalgia and take a measured look at the old systems, we see that they had significant shortcomings. Eventually, all gear becomes obsolete, replaced by better products with much better sound. Witness the demise of the 8-track tape, cassette tape, and in more recent days the CD. As might be expected there is a sector of contemporarily challenged audiophiles who adhere to the notion that vintage gear is sonically better than new. No matter the topic, there will be some people who simply do not wish to move into the future and continue to claim that the past was better. There are not many human activities involving technology where that perspective survives. Do people lament that TV’s were better 30-40 years ago? How about cars? Computers? Bicycles? In almost no human activity involving technology is older better, except perhaps in terms of longevity. Technologies come, and technologies go, and now with the advent of a more affordable integrated digital amp in the Exogal Ion I predict that in the future we forward thinking audiophiles will no longer be using analogue amplifiers. Don’t scoff at that statement, as you haven’t heard the Ion – yet. When you hear it I predict you will nod your head, even if reluctantly, in agreement that the digital amp is the future. Four or five years ago I proclaimed class D amps were the future. Now, with the advent of the Exogal Ion PowerDAC I’m altering my proclamation; as of today the future belongs to digital amps. The Ion PowerDAC is forcing a rethink of my expectations, for just a year ago I was enthralled with the Red Dragon S500 class D amplifier. Here I am only several months later saying that a better technology is here. Technology creep is very disruptive. The digital world is changing with breathtaking speed and yet much of the HiFi industry seems stuck in a time capsule. Big, heavy analogue amps, tubes, vinyl – to persons under 25 these things make audiophiles seem incapable of integrating technological change. For a while the vinyl is cool, but that novelty wears off, worn thin by the demand for convenience. Don’t misunderstand me; I can put together a wonderful sounding traditional system, as do thousands of listeners who love those products. The problem is that with new digital developments in terms of performance these others get left in the dust. The Exogal Ion races ahead of classic amplification components regardless of cost at such terrific speed it leaves a wake like a comet’s ion trail, for which it is named, of performance particulate to settle on these older, literally slower technologies. Am I suggesting that a solid-state amp or a DAC can be slow? Yes, they actually are “slow” when compared to the performance of the Comet and Ion, and that is what we shall explore. The practical outcome of all this is with the advent of the Exogal Comet and Ion in terms of design and performance, your DAC and your amp have slipped decidedly toward becoming obsolete. Exogal has just killed their performance in a targeted strike. Thus I am the bearer of both bad and good news for you. The bad news is your amp and DAC have plummeted in terms of their performance relative to the new standard. It is tough enough to hear of one genre of component being eclipsed, but two simultaneously is quite painful. However, as the Comet and Ion are reasonably priced for their performance threshold you have an opportunity to own not only the best sound in the price category, but a best sound in the industry now, not five years from now as you wait for it to trickle down in cheaper products. The reason I say “a best sound” is that I have not been afforded the opportunity to compare the Comet and Ion to top end DACs as dcs or MSB or amps such as Boulder, Constellation or Soulution. That would be a very interesting comparison, one that I am open to if these other companies would like to send me their equipment. It is possible that these others would run circles around the Exogal combo, but I suspect not. From what I have heard of dcs, MSB, Boulder, Constellation and Soulution at shows I think the Exogal pairing would compare quite favorably. The Comet and Ion are priced for Millennials and sandwich generation music fans who don’t have a great deal of disposable income, but the Comet/Ion perform together more like components designed for “one percent” audiophiles. Your amp and DAC are still operationally fine; you could run them for a considerable time. As long as you never hear the Comet and Ion you could be happy. However, your components have been made obsolete by the advancements found in the Exogal Comet and Ion, and those who gravitate toward them will have an “out of this world” experience enjoying them. It will help to appreciate what has happened as you learn what the Comet and Ion are and what they are capable of when used together. Technology creep also presents us with plenty examples of insipid change promoted as monumental. As might be expected, Exogal is not the only company trying to upend the market. More recently we have seen the introduction of QOL, DEQX and MQA. Having heard the first two they were not inspiring enough to merit a review and the last seems stuck in development limbo. Perhaps you will believe me when I say that the performance advantage conferred by the Comet and Ion is such that they do not deserve to fade away, but rather be adopted by scores of audiophiles. In 2010 NAD brought out the M2 Digital Amplifier based on PWM (Pulse Width Modulation) that was purported to sound very good. NAD seems to have reverted back to separates for their Masters series in the M12 Digital Preamp DAC ($3,499) and M22 Stereo Power Amplifier ($2999), an nCore hybrid Class D design. It would need to be a revolutionary development in Class D to be competitive with the Ion’s digital amplification. The M22 has what is called “Power Drive”, which senses a speaker’s impedance and adjusts the amplifier to suit the speaker. It might be an efficacious technology, but only a comparison would tell if the M22 would compare favorably to the Comet and Ion. The Technics R1 Reference System was lately reviewed in The Absolute Sound and it has true digital amplification, but also carries a price tag of $26K for the electronics and $27K for the speakers – not accessible for most audiophiles. Conversely, here comes Exogal with an extreme resolution DAC and digital amplifier with real world pricing, $8K for both the Comet and Ion, as the Ion must be used only with the Comet. While this is not cheap it is much more affordable than the Technic’s $53K price tag including matching speakers. Regarding the radical difference in appearance of the R1 System and the Exogal products, people seem drawn to meters on amplifiers. I adjure the reader to not judge the Exogal products by their diminutive size and lack of fancy meters, as it is not the size of the case, or the meter that determines the sound. The technology employed in the Comet and Ion ultimately must result in performance worthy of the price. In a barrage of testing the performance of the Comet and Ion pass the Law of Efficacy easily. How did you hook it up with the Whispers processor? I have the Aeris and I am not sure how it integers with the Xilcia 4080 processor. Is Devialet digital or a hybrid of A and D? I’m sorry if it wasn’t clear; my set of Whisper speakers is custom and has both passive operation and active operation modes. If your set of Aeris speakers are only actively run, then it would be problematic to use the Ion. Please see my review of the Legacy Whisper DSW Clarity Edition for further details on my speakers. Legacy is offering an upgrade to the Aeris in the new Wavelet processor, and I suggest you look into it as a nice boost to performance. I often compare products which seem similar to determine how they fare. There are many factors which go into the final decision on which products to review and write about, and I am not interested in discussing them here. I do not care much for the politics of the industry, so suspicion that I would purposely avoid a competitive product is off-base. Unless you know information about the technology which Exogal is using but has not released I conclude you assume that Exogal and Devialet are technologically doing the same “radically new” thing. Both in my examination of the operations of the Devialet and Exogal, and in communication with Exogal specifically on that question, I understand they are not similar. My opinion that Exogal has created a new breed of sound/component remains unchanged. I am not interested in further discussion or debate on this topic. I have learned from Exogal that the occurrence of the “IONOVT” message in the display of the Comet can also be shown when the amplifier has a current demand by a speaker greater than the current the Ion can provide. The test which produced the shutdown was ironically on the track “Galaxies” by Owl City, which has an enormous amount of LF. I had to play it at about 97-100 on the digital readout of the Comet to trip the safety shutdown; that would be right at 90dB. That was with the Sound Lab U-4iA speakers under review. In other words, when using less efficient speakers with more difficult loads the Ion may not push them to unlimited listening levels, as I discuss in the article. However, importantly, the issue causing shutdown is not overheating, but simply the amp not being able to drive the speaker pushing heavy LF at higher listening levels,, well beyond where most people listen. I am pleased to know that there is no overheating happening, and that the protection circuitry in the rare case the amp is overdriven works superbly. This strengthens my impressions of the Ion, and I strongly recommend it for such speakers at more conservative listening levels. Frankly, it drives such speakers well beyond the limits I anticipated. So the only way to use this digital amp is to hook up a DAC and power supply from the same company using a proprietary interface? Yeah, that seems reasonable, cost effective and generally great for the end consumer. Thank you for your review of the Ion – Comet from Exogal. I just placed an order based on your word! Can you share some speakers / speaker brands (in addition to those you discuss in your review) that you feel would pair well with the Ion? I have already noted ones which rely on box reinforcement as not being as good of a match. I recently found a review on the Shure se215 on this site http://in-ear-headphones.com/most-durable-earbuds-2016 and I decided to buy it for me. My question is, if I purchase a DAC would the sound quality improve considerably? If I read your post correctly you are being sarcastic, as you state, “So the only way…Yeah”; if I misread, my apologies. If you look at only the digital amp function, then your skepticism is warranted. However, your analysis is simplistic. The value and power in the combo is that it contains all the system needs, source, preamp and amp. There are plenty of companies which offer full systems with source, preamp and amp, yet cost many multiples more and theoretically have maximum synergy when used together . I do not see much justification in dismissal of Exogal simply because they choose to package the functions differently than more traditional manufacturers. Frankly, it is a gift to audiophiles that they allowed the Comet to be used independently of the Ion. That they offer the stunning performance of the upgraded DAC/PowerDAC combination along with superlative amplification for such a low price is remarkable. If you got the impression that the Comet/Ion combo would not sound good with box speakers from my article I apologize. I would think they should sound terrific with them. I don’t particularly pursue speakers with the boxy resonances, but if they were favorable to me I would not hesitate to put the Comet/Ion with them. Aside from perhaps those speakers with very low impedance, which would take ridiculous amounts of power to drive, I suggest it’s a wide open world. As a jumping off point scan my past 12 years of speaker reviews. I would be very happy to retrace my path and use the Comet/Ion with any of them. This is the most universally applicable component review when it comes to speaker matching I have ever written. So, essentially, name the brand of speaker and it would likely sound great. While a dynamic range of 105 dB isn’t amazing, it is fine for 16-bit content. 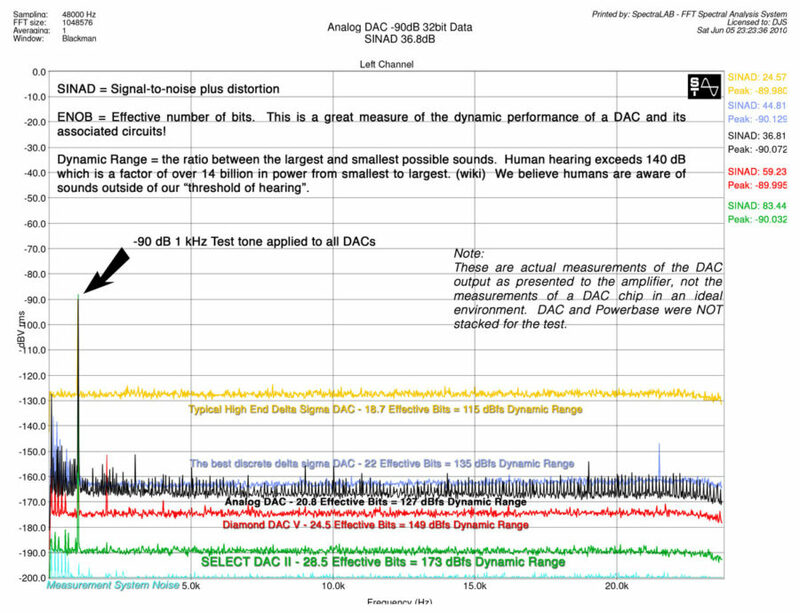 Compare to – 173 dB of MSB Select DAC II. A PowerDAC is hardly a new concept. I haven’t heard it, but it was hardly a technical (or business) failure. Selling for $40,000.00 USD . A present product (and lower-end competitor to Devialet D-Premiere / Expert), it’s been out for 2-3 years. Admittedly, it’s integrated, with one box. It’s 190 watts at 8 ohms, and 350 watts at 4 ohms. I agree with others that the Devialet should of been a comparision. Sorry for all the links posted to your great website. I just wanted to back-up my notes. Measurement comparisons are interesting but real world user experiences is what is important to us. We believe that our product allows our customer to be swallowed up in the music. If you’re a guy who plays music to listen to his gear, you’re probably not our customer. The original Wadia PowerDAC was never a commercially viable product. Yes it was announced, yes a few were sold, but they weren’t reliable and never worked right and were quickly taken off the market. The Intuition is not a power DAC, it’s an integrated DAC and Amp with a manufacturer’s data sheet reference design Delta Sigma DAC and a standard Class D amp from PowerSoft. And the guy who invented the hallowed Digimaster design now works for us and has gone light years beyond anything Digimaster ever did in a completely different way. Digimaster is a bicycle. EXOGAL DAC technology is a Tesla. And what, the review is invalid because Mr. Schroeder didn’t compare us to Devialet? Please. You should go listen to the Comet / Ion Combo. If you like it, buy it. If you don’t, no hard feelings. Hey Douglas, Thanks for a great review. I presently own the Comet with separate power supply. I absolutely love it. You’re article sold me on the Ion, but I think I’ll wait on the monos. Would be nice if they have a Analog to Digital converter with XLR inputs so I could listen to my SACD’s. I have a large collection I use often. Or, it would be nice if Exogal would introduce a Transport for the Exonet system. Not opposed to replacing the old Esoteric player. Thanks again for the informative review. Happy to have you join the Exogal club! I appreciate the feedback. I hope the wait for the Monos is not too long. I suggest you work toward file playback. I wrote up the Salk Audio StreamPlayer III, and it is a wonderful product used with Tidal and ROON. The sound quality is splendid and convenience off the charts. I suspect you could achieve sound quality equivalency to SACD with a good file server/streamer. It’s not a very expensive proposition, certainly less than an Esoteric player. They always say “Never say never” but when it comes to transports, we’d come pretty close to never… But only because we don’t see any way to make them better at a lower price point. We’ve been asked about A2D’s and Phono Stages but it’s kind of the same answer as with transports. I think the DAC is a winner and competes up to $12k dacs. I like it better than my Grace m905 and Schiit Yggrisil. It absolutely murders the mushy, boring AMR DP-777SE. Is it better than the EMM Labs Dac2x? No. Just simply, no. Note: I use AES input with Balanced Output. I’m a USB hater although I admit it’s getting MUCH better. But the USB dac technology seems to have softened and quieted it to death to make it sound nice. Again, to me reproducing live music is what it’s about. To add, why is it not the best? a little dark sounding and not the last word in accuracy, natural timbre & spacial queues. To be the best the guitar needs to sound exactly like a guitar, and feel like it’s in your listening room, same with cymbals, voices and everything else. but does the combo “sound” awesome? yes. Sorry to be annoying…but this is for the sake of accuracy. A/B’ing has continued. Listened the Schiit Yggy for the first couple of times with XLR balanced output and it’s a totally different DAC than when using it Single Ended…I prefer it to the Comet. Cleaner, more open, spacious, and gorgeous. It’s the most extreme difference I’ve heard a component between SE and XLR, it’s strange. We are essentially in agreement. When you confirm that the Comet competes with up to $12K DACs, that covers the bulk of the market. That it takes a $15+K DAC to best it is an exciting conclusion. The Comet and First Watt J2 was airier, but lost a lot on macrodynamics, as would be expected from the 25wpc. I haven’t heard the combo, but suspect the F7 would suffer the same anemia compared to the Ion. Recall that I used the Comet/Ion with five speaker systems ranging from higher efficiency dynamic to electrostatic speakers. The First Watt was a non-starter with the Sound Lab U-4iA, while the Comet/Ion blew the doors off the speaker, and that with 100wpc. So, my comments must be taken in the context of a wider range of speakers and the combo excelled with all of them. That is worth popping the champaign cork. I am disappointed in the connection between the Comet and Ion being so difficult to upgrade as imo it is crucial. There seems to be a paucity of high quality passive HDMI cables. I suspect that the Comet and Ion are operating “with one hand behind the back,” in the wrestling match between it and other combinations due to the economical HDMI link. (This is my opinion, not the opinion of Exogal.) Enhancing that I suspect would substantiate my seeming over-the-top claims and fix the perceived shortcomings you note. So yours is the definitive decision…for yourself. Congratulations. Everyone is a critic, an expert…for their own ears and write about what they think. You post a comment about how you thought the other amps you listened to (Krell!) were better than the Ion. Then you hear something else on the source side you say sounds so much better than the Comet. Maybe you should try the speakers next then circle back to the Comet/Ion? EXOGAL does state that USB is the preferred input for the Comet. Your admission of being a “USB hater” seems to preclude that consideration. Was USB ven tried? You have at least taken the time to listen and compare using your own preferences and biases over those of others who write in proclaiming injustice because the such-and-such DAC was not compared in the review without giving the equipment under review so much as a listen. As an owner of the Comet Ion combination for several months, I read Douglas review with great interest. As applied to my system (Silver lie Sonata speakers – 93 DB, 8 ohms / Aurender server) I found Douglas’ observations to be spot on. Very fast, dynamic, quiet, natural tones. They replaced considerably more expensive dual mono tube amps and preamp from a highly regarded manufacturer. while I was very happy with the tubes (which were upgraded by the manufacturer over the years to great effect), I prefer the sound, convenience and reduced size of the Exogal / Aurender team. The combination of the efficient Hifiman Edition X v2 headphones and the Comet headphone amp is also highly recommended. I’m happy to see my descriptions fit your experiences! By this time I have heard the Exogal products with a growing list of complementary equipment, and to date I have not heard a poor system when they are used either individually or together. You have a jump on me in regards to describing their sound with headphones as I only have the Kingsound ESL headphones with tube headphone amp. I have a Comet Ion combination with digital input from a Melco and connecting via chord reference cables to Spendor D7 speakers. The Chord Sarum USB interconnect has been a revelation. Would a higher quality passive HDMI replacement have the same positive effect? I am open to trying more passive HDMI cables for the Comet/Ion combo. I have tried one I borrowed from a friend, the WireWorld Platinum Starlight 7, which was made into a “shorty” cable for the Comet/Ion. It did confer a difference, and a positive one, however not enough to induce me to order one. I found that with the Exogal’s stock HDMI cable and an upgraded Ethernet cable I could achieve a similar effect to the “jumper” HDMI. If I were approaching the system from a cost-no-object perspective I might obtain the Platinum Starlight, but I suspect there may be better cables for the Comet/Ion. Anyone with experience in this matter I would very much like to hear back. Now, I am not finished with my exploration of the passive HDMI cables for Comet/Ion. One cable is nowhere near enough attempts to draw a firm conclusion regarding the efficacy of the link. I will attempt to find at least two or three other passive HDMI cables to test with the Comet/Ion. QUESTION: DOES ANYONE KNOW OF AN AFTERMARKET QUALITY PASSIVE HDMI CABLE (Not shouting, soliciting!) which might be suitable for a short link between the Comet/Ion? Please render assistance with your suggestion; I appreciate it! I did look online and found not much about passive HDMI cables, so any suggestions are much appreciated! Note, we are talking Passive HDMI, not the typical active HDMI, which is the majority of HDMI cables in existence. So, concluding, the issue is not firmly resolved at this point. However, I have done enough comparisons in regard to Ethernet links to firmly recommend upgrading them. Article on Ethernet cables forthcoming. I would like to know if you have found “better” aftermarket HDMI cables? If so, which cables do you prefer and what is the audible benefit of them? Thank you. Since I wrote that Exogal has made an upgrade connector; I suggest you seek that from Exogal! At the CES in 1998 I showed the Tact Millennium amplifier designed by Lars Risbo in Denmark. It was a power DAC with 134 dB dynamic range. Since then we have been manufacturing fully digital amplifiers – now under Steinway Lyngdorf, and Lyngdorf brands. We control volume level by regulating a DC to DC power supply giving us full digital resolution over a vast power range. The process was patented in 1996.